Sievern is a small farming village between the port cities of Bremerhaven and Cuxhaven, bordering bogs, swamps and marsh lands. Age old stone graves help define the history of this area, and the people that lived here nearly 5,000 years ago. 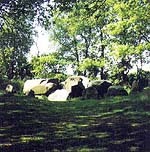 Large megalith graves and mounds are found in an area known as The Pipinsburg (left picture), which was believed to have been from around 900 BC. Also, near Pipinsburg are many heathen and pagan graves, in an area known as Heidenstadt (pagan city). In 1139, the Bremer Erzbischof Adalbero (1123-1148) of the Kloster Saint Pauli in Bremen created a document which designated the Village of “Sivorde”. One of the more noteworthy landmarks of Sievern was the Windmill which was built in 1847. It was used for grain and corn and was retired in 1941. It was partially destroyed in World War II, and became a landmark in 1967. It was totally razed in 1981. In 1970, Sievern merged with Langen, Debstedt and Imsum into Langen Stadt (state). Today, Sievern has many small farms and has become a renowned vacation area. The “Sieverner See” or Lake Sievern (right picture) provides bathing facilities, with many nearby hiking and nature walks. The house shown below was the Cordes Ancestral home. It was built in 1850 by Johann Hinrich Cordes and his wife, Meyn, nee Hencken. The living quarters were in the back area and the larger barn in the front. In 1857, a great fire resulted in the destruction of 64 living quarters and 32 barns. The Cordes home survived the fire. Later, his son Johann Diedrich Cordes lived there with his wife, Anna Margaretha, nee Fitter and their children Adele, Luise and Matilde. Matilda and Luise married and moved out of the house. Luise and her husband Hinrich Budke moved to Lehe, where he was a teacher. Adele stayed in the Sievern house until her death in 1962. In 1949, after the war, Hinrich and Luise returned to Sievern and lived with Adele. Hinrich then became the teacher in the Sieverner schools. In the summer of 1955, Henry and Hans and their families returned to Sievern to celebrate their parents 50th Wedding Anniversary. The party was held in the Sievern House. Attending from America were Henry and his wife Hildegard, with their children Henry Jr, Robert and Anita;, and Hans and his wife Else, with their children Elsbeth and Herman. After the death of Adele, Luise and Hinrich, the house was sold, and by the 1980s was in complete disrepair. In 1989, it was severely damaged by a storm, resulting with a large hole in the thatched roof with two of the main rafters severely damaged. It was in such a state of disrepair and very likely was to be destroyed. In 1990 Arthur Burmeister purchased the house and started the long process to restore it to its original design. In 1994, it was opened as the John-Wagener-Haus, a museum named after a local Sievern resident who traveled to America in the mid 1850s. It remains a museum with many portraits and artifacts from the Cordes and Budke families.